It’s been a while since I’ve blogged anything so I thought an update was in order. I have moved to Atlanta for a while and will be based here for the forseeable future. I would like to move back to the Wilmington, NC area eventually but we will just have to see how things go. In the meantime I just wrapped up another interview. This one an internet talk radio show “123film” on Blogtalkradio. 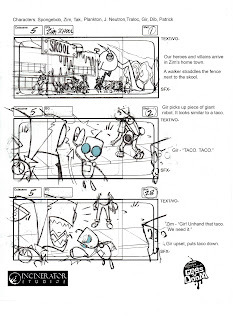 Here’s the link if you want to check it out – http://www.blogtalkradio.com/123-Film/2009/07/08/Craig-Gilmore-Concept-Illustrator. My good friend Sam Heer hosts the show and she does a fine job in covering all aspects of the film making industry and has a lot of great guests on the show. You should check it out and listen when you can. It’s on every Friday at 12pm PST. As far as new projects, I just finished working on the tv show “Army Wives” for ABC/Lifetime as well as a feature film for Reliant pictures called “Main Street” which should be out in the near future. Both where a great time and I enjoyed working with the crew. I haven’t had a lot of time to do much new illustration over the last few weeks and am just now getting back into the work groove. I have been talking to some productions here in the Altnata area so hoping I can attach to one of them soon. 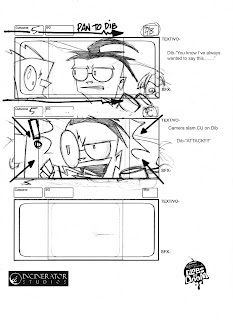 Since I don’t have any new art to show right now I’m posting a cutscene of storyboards I did for THQ Games on the “Spongebob Squarepants and Nicktoons: Globs of Doom” game. Hope you enjoy!